Tweet here. Both series indexed to 100 in Jan, 2010, so lines show percent change relative to that date. S&P 500 index is adjusted for inflation and dividend yields. 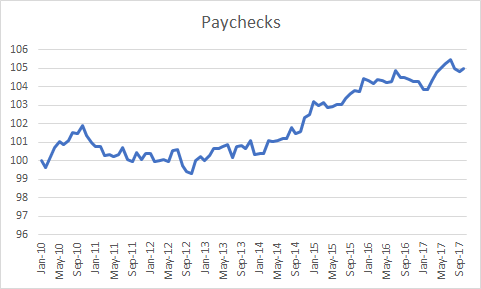 “Paycheck” is the real weekly earnings of the 80% of the workforce that are blue-collar workers in manufacturing and non-managers in services. Thanks to the tight job market and low inflation, the latter has been growing of late (see fig below) which you don’t really see given the scale on the figure. That’s not chicanery, ftr; it underscores my point re relative growth rates. Share the post "Data note for figure in tweet"
6 comments in reply to "Data note for figure in tweet"
No, the figure above showing increasing paychecks is definitely chicanery, as hourly wages are stagnant (fell a tiny bit last month) and only increased hours and super low inflation give the appearance of better wages one normally expects is reflected in your graph. To be fair, the graph is accurate in a narrow sense, displays actual statistics, increased weekly earnings. What it doesn’t reflect is rising hourly wages and the real reasons for the increased earnings. This means there is more than just a scaling problem in looking for hopeful signs in the data. It is encouraging that hours worked increased, but when that makes up a third or more of the gains, it needs to be stated prominently. Same thing with very historically low inflation. When real earnings jumped in the middle of the summer, it was because inflation dropped to .1 percent for the month, an annualized rate of 1.2 percent for the year, reflected in 1.7 percent for 12 month moving average. So what tight job market are you talking about? The one with a stagnant wages and declining wages the past six months? Or the one with nearly a million less prime age workers in the labor force? Or maybe it’s the one with really low inflation that masks poor wage performance? The Consumer Price Index for All Urban Consumers (CPI-U) rose 0.1 percent in July on a seasonally adjusted basis, the U.S. Bureau of Labor Statistics reported today. Over the last 12 months, the all items index rose 1.7 percent. How about increased hours (not wages) by .3 percent which should translate into increased earnings? I’m not understanding why I’m required to spend hours to find this data and prove my case, but of course anyone in the real world with a job knows this instinctively. The economy is not great an far from it. Obama and Clinton tried and failed to paint a better picture of the economy than was the case (Prosperity is just around the corner, we see the economic light at the end of the tunnel). Why do I read the same story here? Especially now? Wasn’t true then, isn’t true now. That’s why we have Trump. Briefly, considerations which allow people to play with statistics if you let them. participation – when it is so low, how can that not reflect slack in labor market? Especially when the numbers involved are large. monthly vs yearly and moving averages – especially for interplay of inflation, showing effects on nominal and real wages and earnings is critical. Inflation is low partly because of weakness in U.S. and global economy. To further hammer home the point, real hourly wages of production and non supervisory workers are up only .2 percent (past 12 months) even with the very low inflation rate of 2 percent (over last 12 months). One has to realize that wages are normally locked in for a year at a time, but inflation can jump up and down. Of course job churn changes average wages constantly, but mostly in the temporary worker market. The employer doesn’t adjust wages monthly for continuing employees, so one has to ask how the employer is anticipating 2 percent or less inflation? They don’t. So the workers are getting 3 percent nominal raise (although this includes supervisory and non production workers) partly on momentum of normal inflation expectations, and not a robust economy or tight wage market. But it gets worse. The Atlanta fed tracks continuing employees here: https://www.frbatlanta.org/chcs/wage-growth-tracker.aspx?panel=1 If continuing workers get 3 percent raises, non-continuing are getting less. October 2017 over October 2016 shows only a 2.4 percent increase for all workers as shown here vs. 2.5 percent for production and non supervisory. https://www.bls.gov/news.release/empsit.t19.htm Evidently someone forgot to tell the economy supervisory employees should get bigger wage increases. So the Atlanta data seems representative of everyone. Sadly that means for the continuing worker getting 3 percent, the new worker gets less and less than inflation even, because churn is not over 50 percent by any means and you still need to get an average of 2.4 percent. How do you explain new workers or workers with new jobs getting at least a few percent less than the previous year? Again, all this going on with very low inflation, partly thanks to fracking, partly thanks to a weak global economy. It won’t take much for Trump to improve the economy when the bar has been set so low. My chart is better than your chart. If you want to look at inequality, it doesn’t make sense (and it’s disinformation) to give S&P 500. Why? Because inequality comes from income distribution and not from capital gains, so says Saez and Piketty, plain as can be in their charts. Clearly capital gains are not the problem. If you also look at the Fig 3, of the .01 percent, even there a little less than half their increase is from capital gains. But that is only 2 percentage points of the extra 20 percentage points of national income the top decile (top 10 percent) of wage earners captured since 1980 (they now earn 50% of all income, up from 30%, $3 trillion a year more than they would under 1980 distribution). 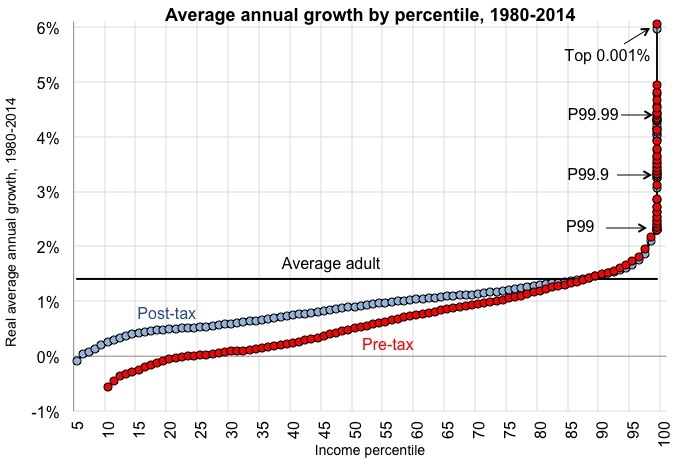 It’s true that the top 1% and top .1% take outsized portion of gains, (first brought to my attention by Krugman, looking at Saez Piketty data, though I’d found their income data previously before they were famous). But it is collectively the entire top 10 percent who took the extra 20 percent of national income, who benefit from inequality and are a large enough group to run the country. But, again for emphasis, look at the chart, inequality is about income, not capital gains. No more S&P charts please. Since 1982 the FOMC has preferred a slack job market in order to tame inflation. 9 of the last 10 times they have raised rates, a recession ensued. The FOMC has been more than happy to allow unemployment in order to disinflate the economy. In Sept 2008, when AIG, Bear Stearns, and Lehman were going bust, they were more concerned about inflationary pressures (read the minutes!). The Fed funds rate was 2%. 6 weeks later, it was 0%. oops. Wages will revert to a healthy gain parallel to productivity when the Fed stops treating the 2% inflation target as a ceiling not a floor. Meanwhile, the fed is raising rates with no inflation in sight. Why should there be? 9/10 times the Fed raises rates since 1982 the economy enters a recession. Its only a matter of time. No real point expanding business or paychecks when Fed induced labor market slack is right around the corner!